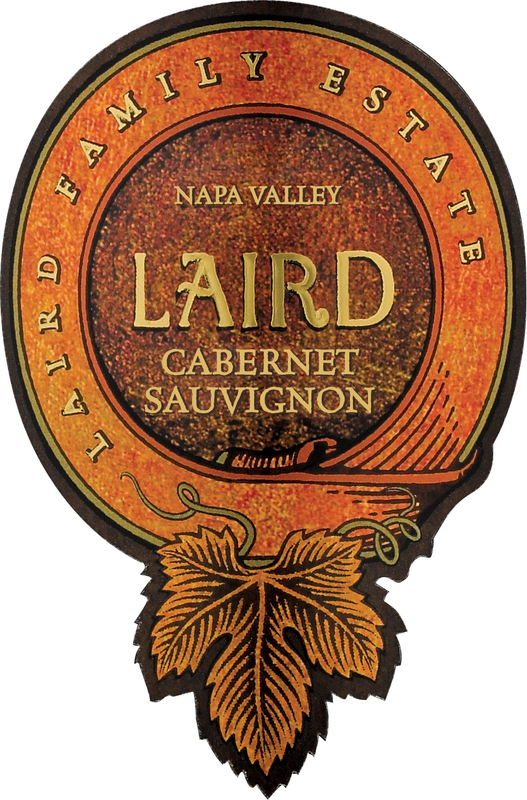 Laird Cabernet Sauvignon Napa Valley is made from 100 percent Napa Cabernet. This 100% Cabernet Sauvignon is sourced from three vineyards: Mast Ranch, for its earthy and robust structure, Flat Rock Ranch, for its fruit-forward characteristic and silky structure, and Linda Vista Ranch, for its juicy and vibrant approach-ability. Tasting Notes: Opaque ruby color with a tinge of purple introduces developing aromas of blackberry jam, cranberry, and acacia flower. This medium-bodied red wine expresses flavors of ripe black plum, walnut, and cassis on the front of the palate, and is complemented by chewy tannins and juicy cherry on the finish. "A rich, unctuous wine, the 2014 Cabernet Sauvignon (Napa Valley) is sweet, layered and enveloping in feel. Dark cherry, plum, mocha, cloves and new leather are all fused together. This is an especially intense, flamboyant expression of the vintage." "Aromas of blueberries, currants, spices and concrete. Medium to full body, firm and chewy tannins and a flavorful finish. Needs time to soften but so pretty already. Drink or hold." After nearly 50 years in the wine business, we understand the ins and outs of the industry, from the trends to the challenges. We believe that our success is due to our vineyard expertise as well as our shared goal to produce great estate wines. With a concentration on Napa and Carneros vineyards, we have sought to produce wines that are “a window to a place.” Each one of our vineyards is different in expression, with its own subtle, yet distinctive character and voice. Each year renews in us an intense drive to understand, react to, and work with each vineyard to allow it to reach its full potential. This process, lead by our winemaking and vineyard management team, is crucial for the execution of successful wines. Date Founded: Growing grapes since 1970. Making wine under their own nme since 2005. Winery Philosophy: With nearly 50 years in the wine business, we truly understand the ‘ins-and-outs’ of the industry and are able to meet the unique trends and challenges of the wine business. We believe that our success is due to the combination of vineyard expertise and a shared vision and goal to produce great, estate wines. With a concentration in Napa and Carneros vineyards, we have sought to produce wines that are “a window to a place.” Each one of our vineyards is different in expression: each has a subtle, yet distinctive vineyard voice. With every year there is an intense drive to understand, react to and work with each vineyard to reach its full potential. This process, lead by winemaker and vineyard manager, is crucial for the execution of successful wines. Our story begins over 75 years ago outside of South Boston Virginia as twelve-year-old Ken Laird drove his mule wagon through tight rows of sticky, fit-to-be-harvested tobacco leaves. As the gooey bundles were thrown up onto the wagon, little Ken led his mule team to the curing barn. It was there, with his grandmother, great uncles and cousins, they would stoke smoky curing fires for their prized tobacco. Ken would be the third generation Laird to carry on the farming tradition. While growing up to be a big city mechanical engineer in New York City, Ken held on to his family tradition of becoming a farmer. In 1970, Ken and his wife, Gail, purchased their first Napa Valley parcel. This neglected piece of land, adjacent to Tubbs Lane in Calistoga, held 70 acres of worn-down prune trees. With Prohibition forty years gone and Napa Valley positioned to re-emerge as viticulturally significant, Ken and Gail decided to develop the orchard into a grape vineyard. While knowing just short of nothing about viticulture, they were also $150,000 short to properly develop the orchard into a respectable vineyard. Picking up a tattered phone book, Ken went to the yellow pages and found eight listed wineries…Robert Mondavi being the only one he recognized. With a phone call, Robert Mondavi himself agreed to walk the property. After they discussed soils, vines, yields, irrigation, and proper pruning, Robert agreed to finance a deal with the Lairds if they would plant 50% Gamay. The deal was struck with a resulting vineyard of 50% Gamay and 50% Cabernet Sauvignon. Mr. Mondavi guaranteeing the Laird’s Cabernet “to be the highest harvest price paid in the Valley.” The support and encouragement of Robert Mondavi would allow Ken to return to his passion: his family farming heritage. By the late 1990’s the Laird vineyard holdings had exceeded 2,000 acres and the idea of making their own premium line of wines began to take shape. Architect, Jon Lail, showed Ken and Gail the plans for the iconic pyramid-shaped, multi-level winery. Construction began on what would become the Red Hen Ranch vineyard property north of Napa. Ken and Gail’s son, Justin, worked side-by-side with Ken in the vineyards and became the Vineyard Manger, while their daughter, Rebecca, became the General Manager of the winery. Rebecca’s daughter, Jillian, was born in 2005, the same year the winery’s first red blend was produced, appropriately named Jillian’s Blend (and it happens to be Laird Family Estate’s most popular wine). Justin’s daughter, Megan, works in finance in New York City. His son, David, is continuing the family’s farming legacy by working with his dad in the vineyards. The vineyard holdings possess a cross section of geomorphic and microclimate idiosyncrasies that are poised to produce particular grape varieties that thrive in their desired terroir. From the thick fog and marine winds in Carneros to the volcanic soils mixed with ancient coastal deposits in the lower bench of the Mayacamas Mountains, they farm their vineyards to produce fruit that best complements the hallmarks of the land.